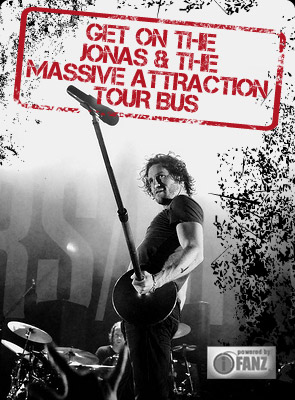 NEW BASS PLAYER FOR JONAS & THE MASSIVE ATTRACTION ANNOUNCED! The band is excited to announced that Julien Martre is the new bass player for Jonas & The Massive Attraction. Julien is not only a great bass player and singer but also a well respected songwriter and producer, who is perhaps best know as the bassist for Montreal pop/rockers The New Cities. In 2009, Julien received the SOCAN award for co-writing the Canadian song with the most radio plays in the country that year. The song “Dead End Countdown” by The New Cities went gold and so did the album “Lost In City Lights” (Sony Music). In 2011 Julien co-produced and co-wrote The New Cities’ sophomore release “Kill The Lights”(Sony Music) and the band went on to support Avril Lavigne on tour across Canada. Their 1st single “Heatwave” (which Julien wrote with the legendary songwriting/production team The Matrix) was an instant summer-hit across the country. Julien spends much of his time traveling between Montreal and Los Angeles, where he works as a producer and is signed with Universal Publishing. Matre will make his debut performance with Jonas & The Massive Attraction at Salle Odyssee in Gatineau March 15th at 8 Pm.